Few people can be able to tell that this hair is not the wearer’s original one without looking very keenly. This design proves that if you know how to choose your extensions well, you can be confident of a natural looking appearance when doing some crocheting. The style uses some thick human hair with some firm curls, and it is just below the chin in length. A nice side part and sweeping the thick mane sideways and over the face is all the styling that you need. 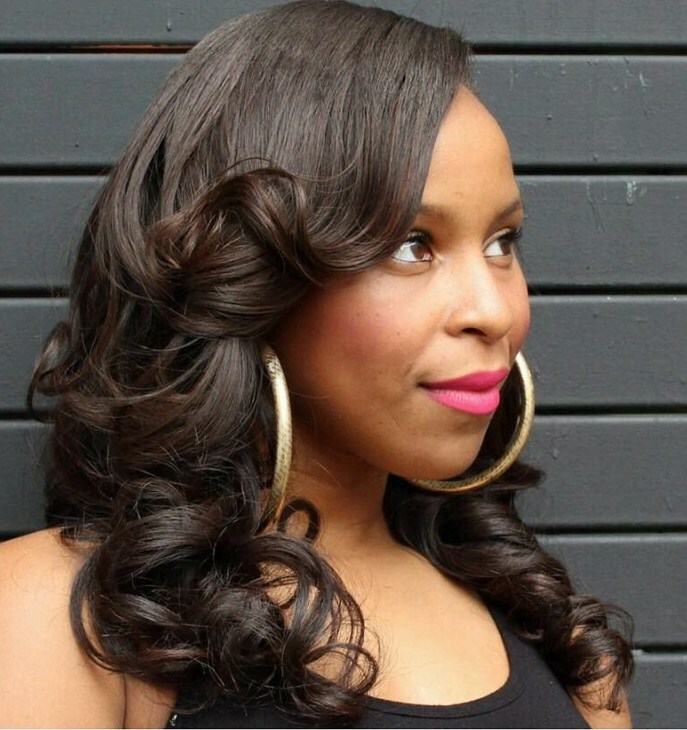 30 Stylish Short Weave Hairstyles — Create the Look of Your Dream! 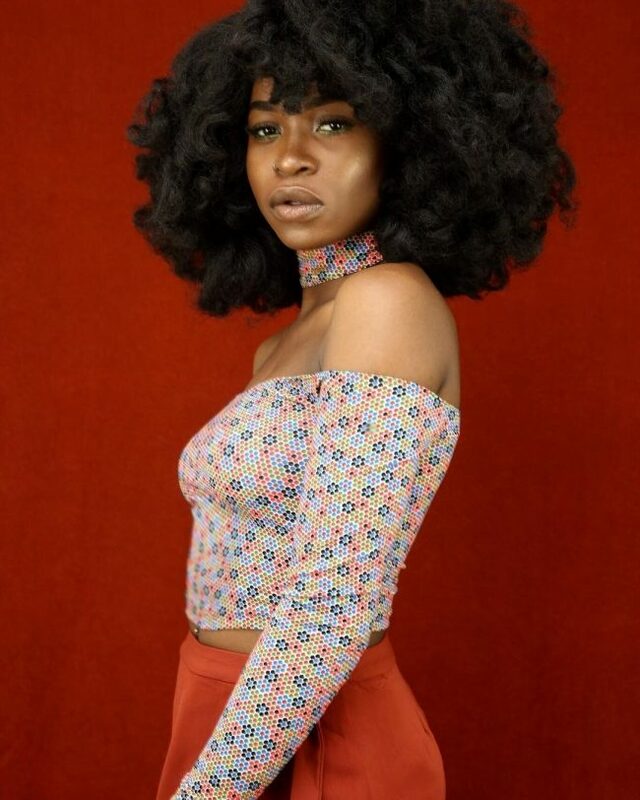 Crocheting allows you to wear any hairdo that you like regardless of the type of your natural hair. 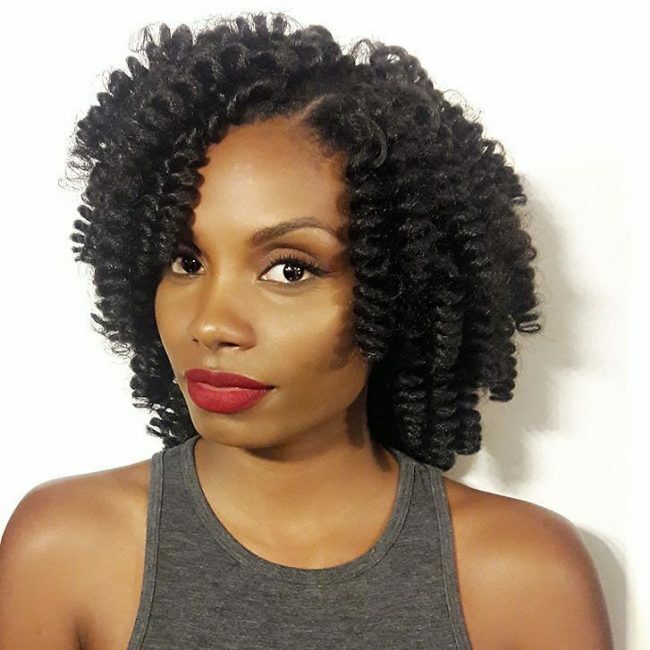 This style keeps things simple and to create it you only need to crochet some soft and thin shoulder-length spirals on your hair and have them in a beautiful shade like dark brown. The long face framing curls in this design are also a product of the inventive use of human hair extensions. They have a lovely brown shade, but their beauty comes from the choice of extensions. Once you have it in place a soft side part and sweeping the hair into a face frame are the only other things that you have to do. Everything from the color of this hair to its length and styling makes it look very natural. However, this is just what you get if you choose your short extensions well and crochet them without any leave outs. It is hard to go wrong with faux locks as they are one of those protective styles that will look good on any woman. In this design, they have red and black shades which give them an adorable color pattern, and they are medium in thickness and quite long. For styling, you only need to sweep them to the back. 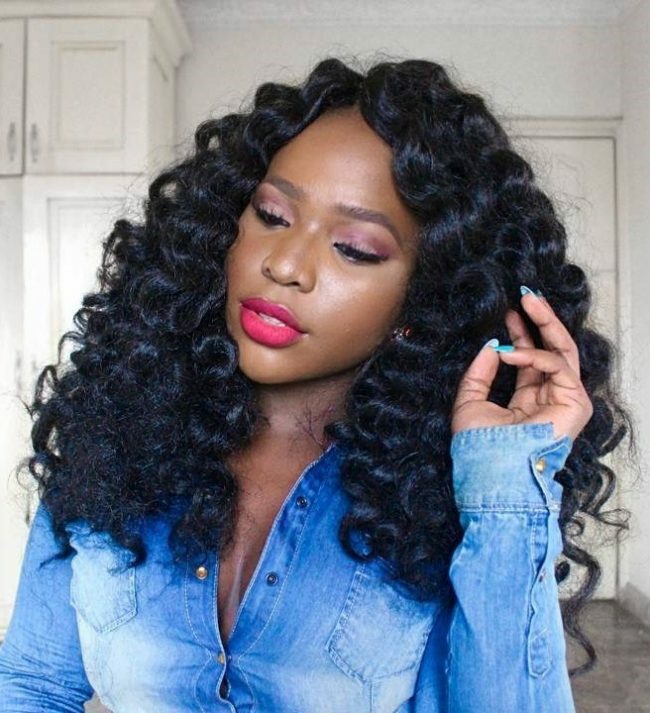 A full weave hairdo like this looks very natural and sturdy, but the best thing about it is that it is very easy to create. 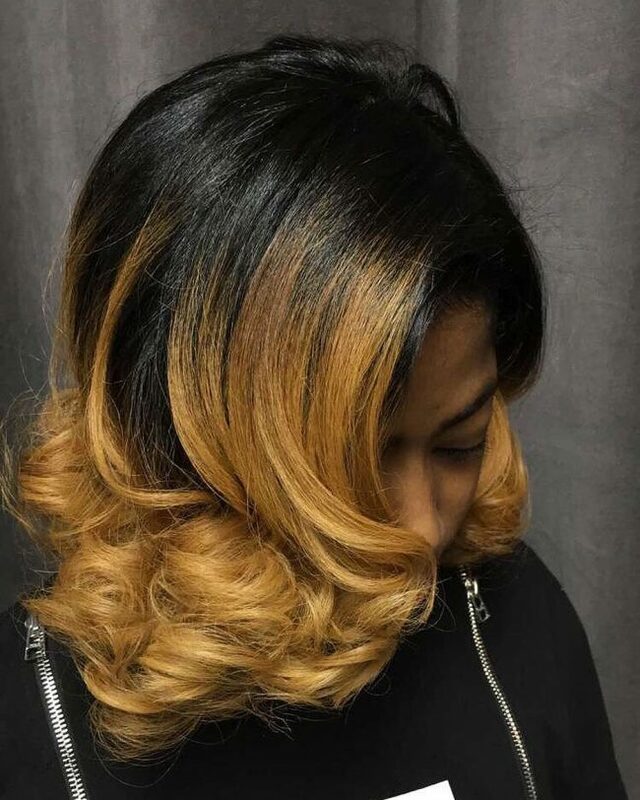 This particular one has a beautiful dark tone, and it is curled on the ends to enhance its appearance, and you should style it inventively to accentuate your face. You can use a flat iron to create the silk out in this hairdo, or you can use extensions that already have the appearance. 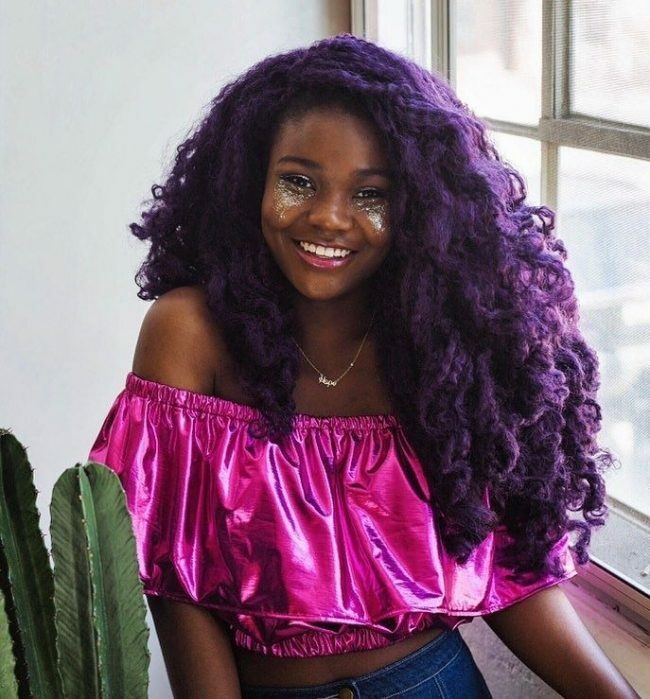 However, what makes this hair unique is the fact that the ends have some nice thick curls and the color deign is also amazing, and it entails transitioning from a black base to a bright brown hue in an ombre pattern. It is still possible to achieve this look with your long natural mane by chopping it into some cute bangs and coloring it. 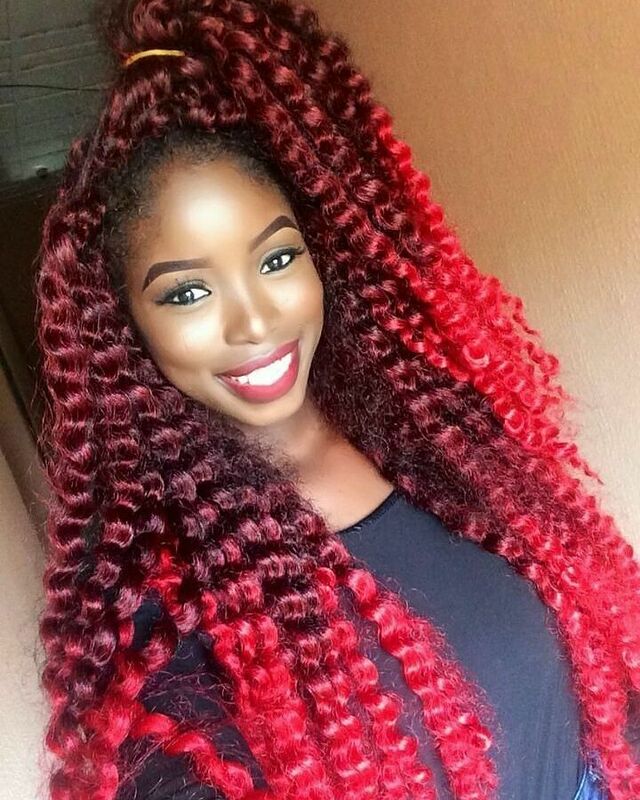 However, few ladies have such a lovely hair, but this should not be a problem because crocheting some quality virgin hair will still create the same appearance. You only need to choose the right color and also give it some moderate trimming to enhance the natural look. 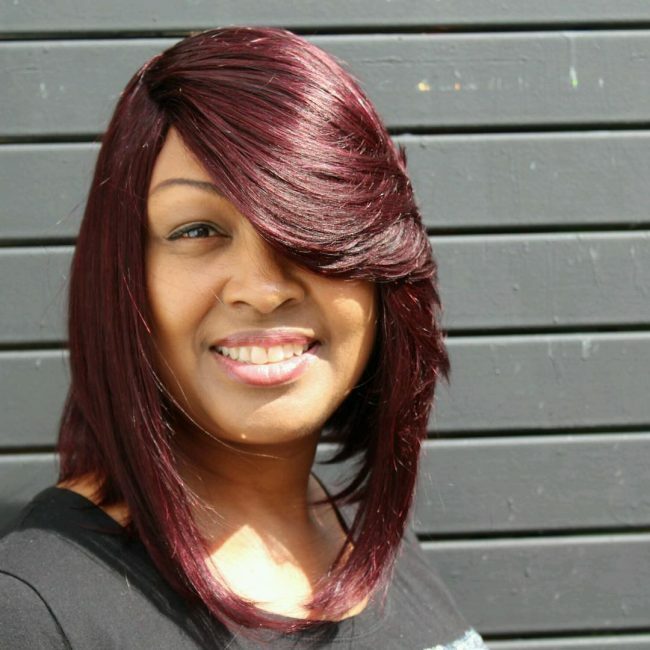 The copper color of these extensions is amazing, and it will help brighten the appearance of any woman. Apart from this the hair also has an appealing natural look, and you only need to style it with an inventive diagonal sweep to finish the design. 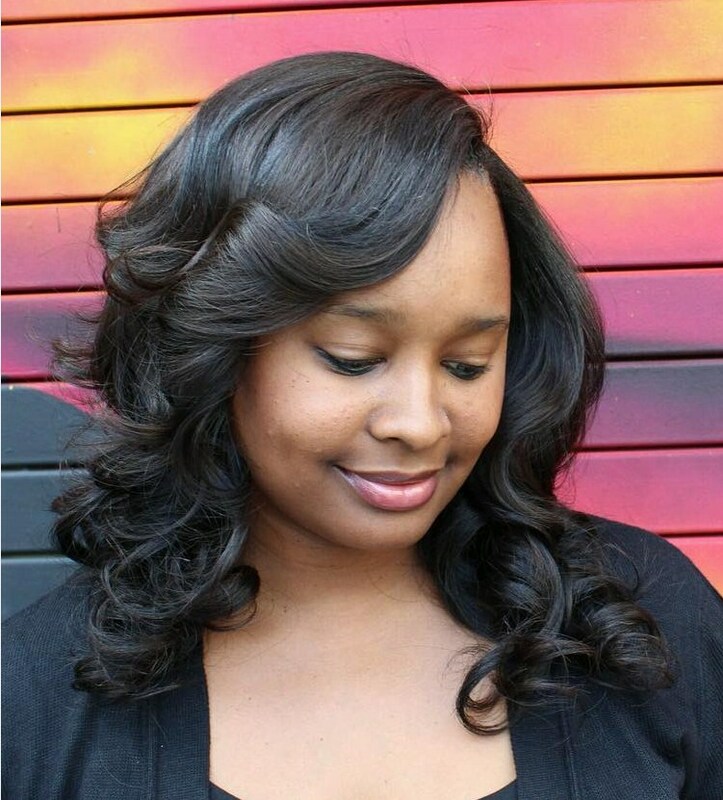 This beautiful hairdo has a silk pressed base and some thick curls on the ends that make it look glamorous. The styling that entails creating a side part and sweeping the hair sideways and over the forehead is also splendid. Ladies that want something that looks natural and does not make it look obvious that they have some crocheting should go for this style. It is a silky and soft weave that is also quite long with some thick waves on the ends and a distinctive side part line. The beauty of a crochet weave is in the choice of extension and the styling. 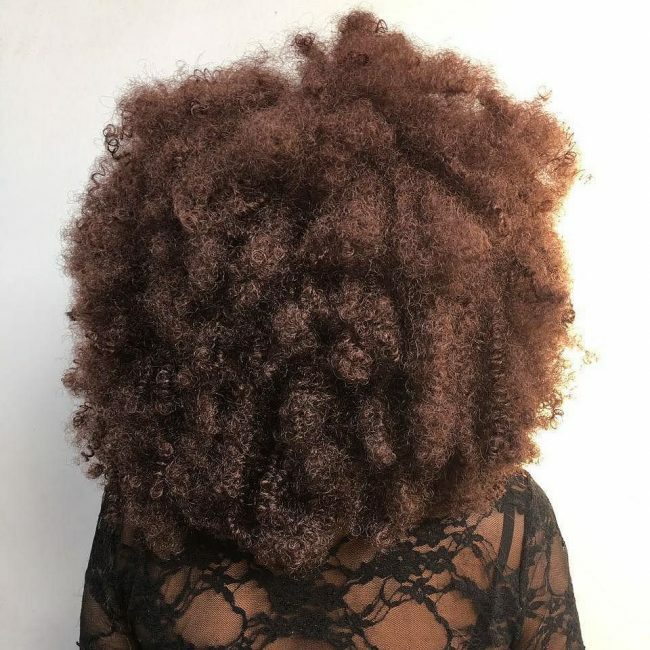 This design entails crocheting some thick afro spirals to create a thick mane with a lovely dark brown shade that will look beautiful on most ladies regardless of their skin tone. 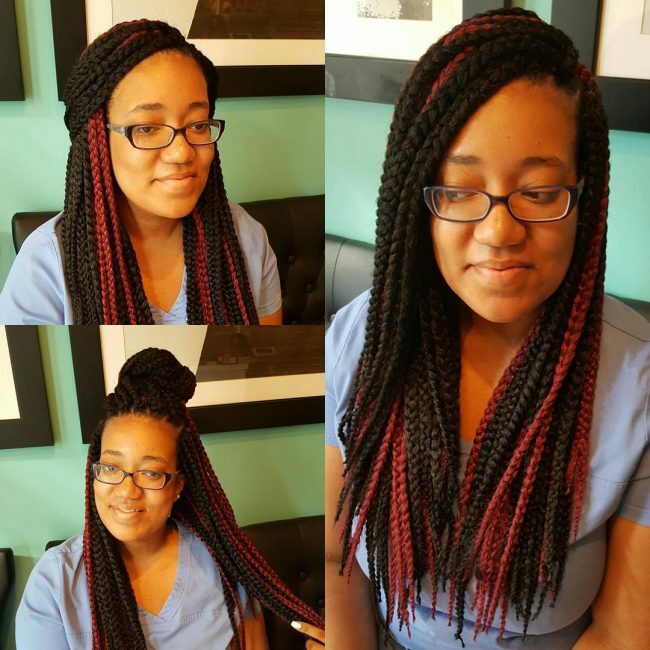 These massive Marley twists have an incredible burgundy shade and black roots that make them look fantastic. 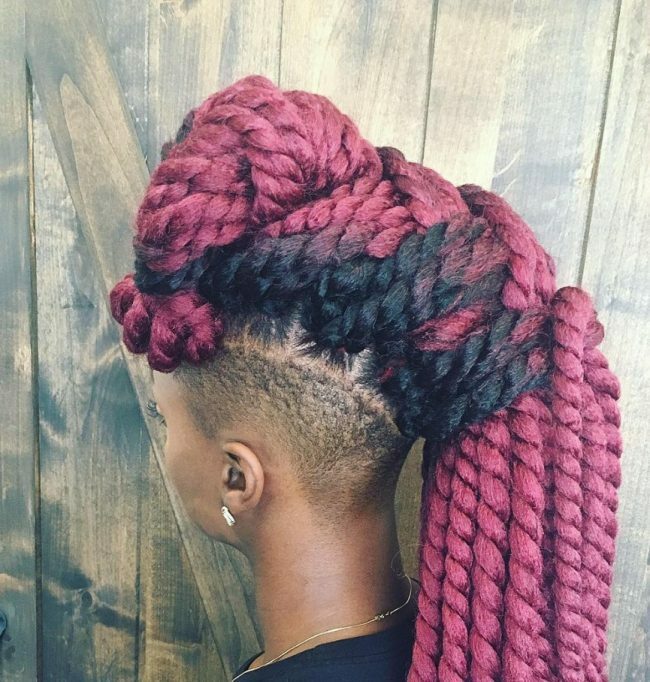 However, they also have a unique mohawk design that comes from shaving the sides and leaving the twists at the center of the head where you should finish by weaving them into a tight and intricate design. Thin twists look neat, and they are also easy to style and if they also have a beautiful shade like in this design you can be confident of a head-turning hairstyle. 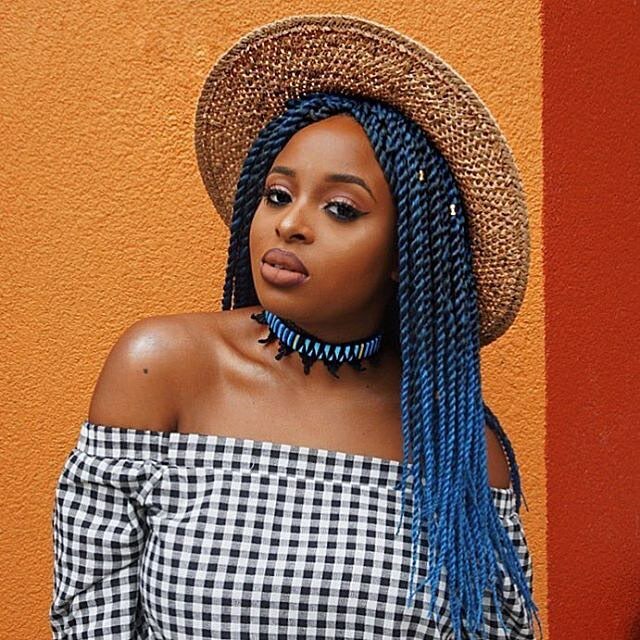 To create this look, you should crochet some shoulder-grazing and spiky twists and then tie a few at the top to create a simple half up design. Although this style looks very sophisticated, you can achieve it effortlessly. For this hairdo, you should weave some cornrows that start on one side and flow towards the other. 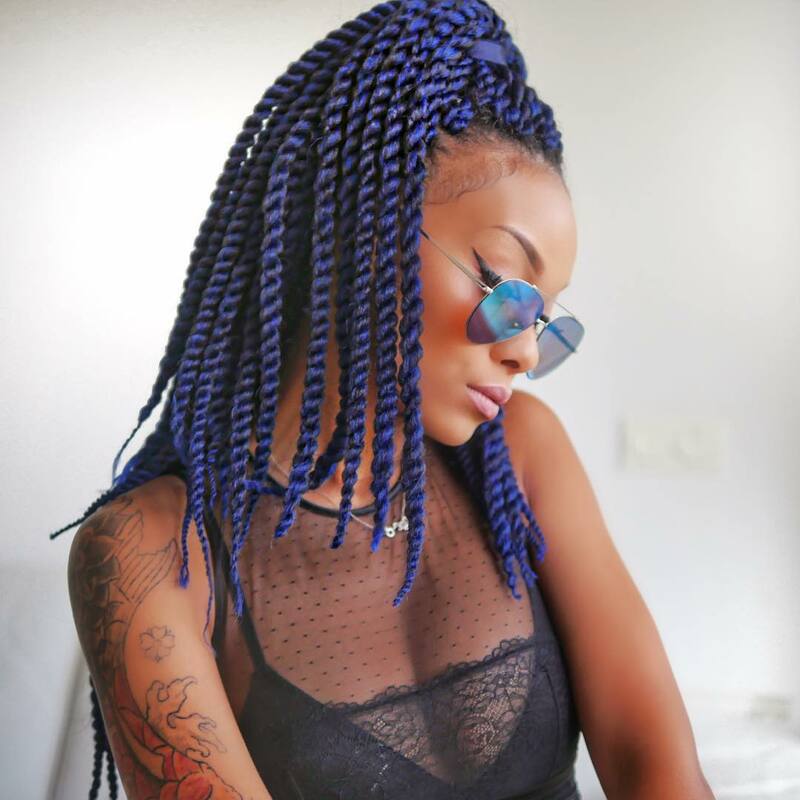 You should then crochet some extensions with loose spirals at the middle of the head and use blue ones at the front section to form the colorful mohawk. 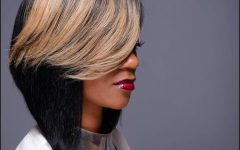 A hairstyle like this is as attention-grabbing as it can get and the best part is that you can create it within a short time provided you choose the right extensions. 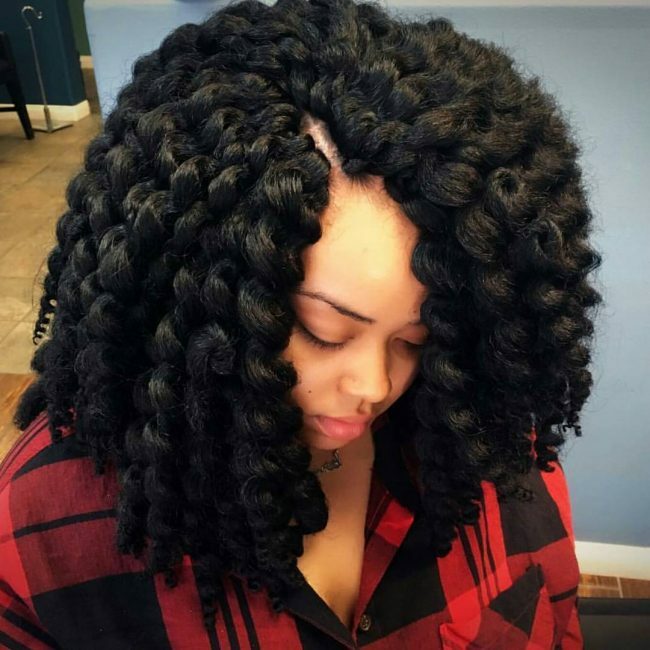 You should go for something with some thick spirals and use more of it throughout the head to ensure you have a full look. Once you have the crochets, you will only need a center part and to sweep the spirals sideways to finish the design. 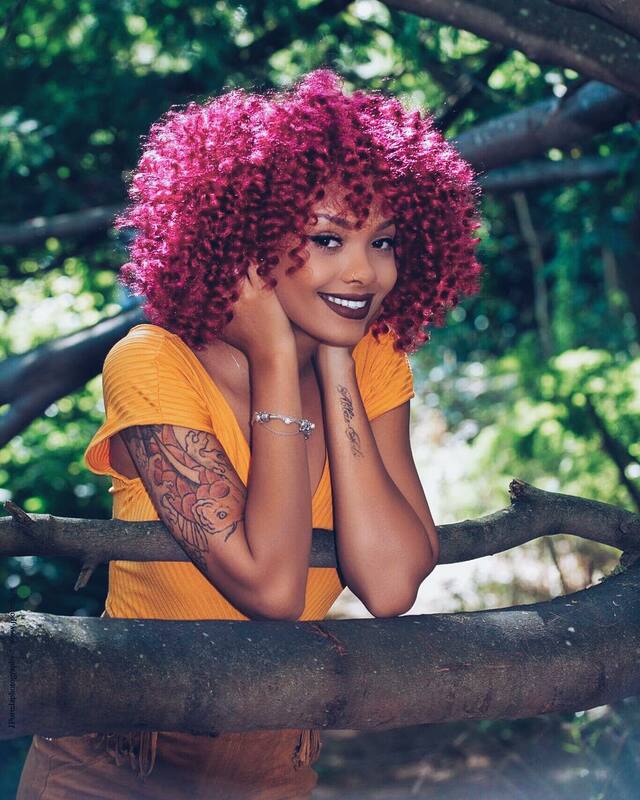 Hair color is as important as choosing the right type of extension when it comes to crocheting. The contrast between burgundy and black in this design is a perfect example of an excellent color choice. 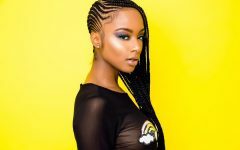 However, the medium size box braids also look stunning, and you can style them into anything from a top bun to a half up design. It is not always necessary to chop your hair short to wear a fancy hairdo such as a bob. 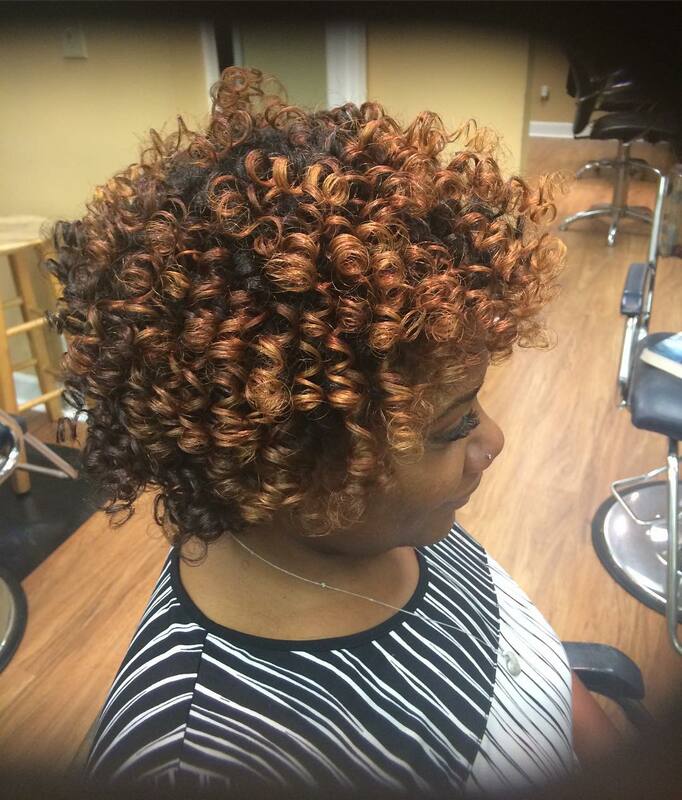 In this design, you only have to crochet some beautiful short spirals into a bob-like style. The spirals also have a dazzling dark brown shade and a simple face frame design that add to their elegance. 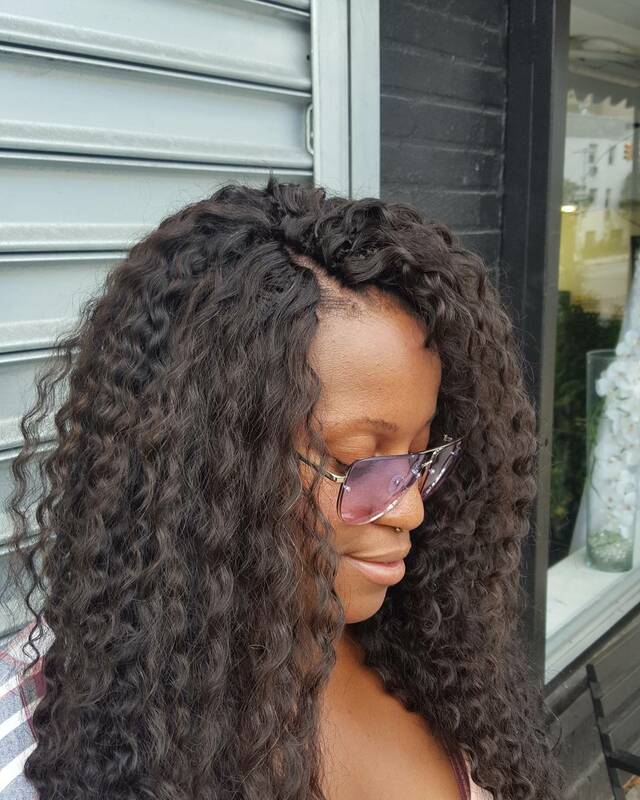 Here is another version of a curly crochet weave but this one has a glossy black tone that makes the curls look very healthy. The shoulder-grazing spirals also have an excellent styling that involves parting them on one side and giving them a side sweep. Blue is a beautiful shade, and this headdress proves that it can create a breathtaking appearance. 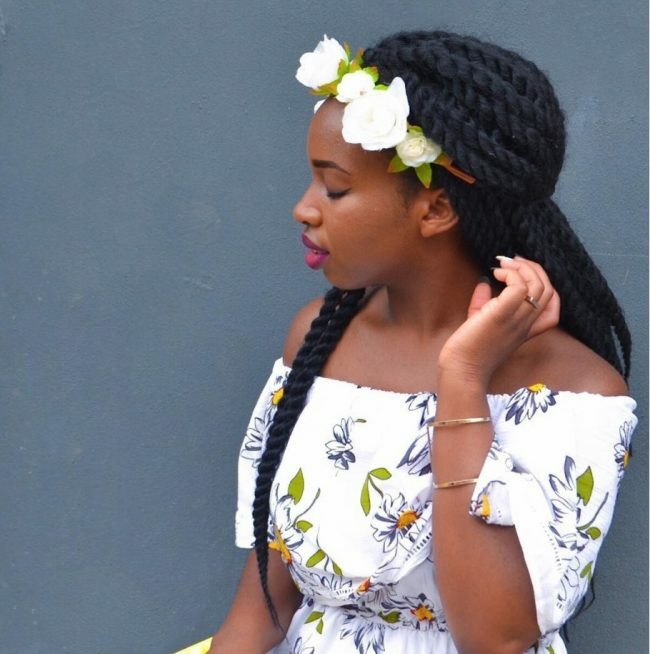 However, the uniform size of the twists and length are also perfect, and the styling that entails tying them at the top of the head into a ponytail also enhances the overall look. Burgundy is a beautiful color that will make any woman look and feel fantastic. In this hairdo, it spices up the chin-length spirals to create an elegant hairstyle that you can enhance by spreading out the crocheted curls. This hairstyle is very straightforward, and you can even create it without any professional help. To wear this design, you will only need some jumbo Marley twists and basic crocheting skills. 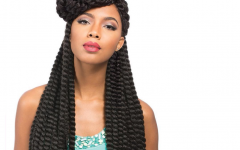 The twists will also not require any intricate styling because pushing them back is enough. You should never run out of ideas when wearing a crochet weave because the options are just endless. 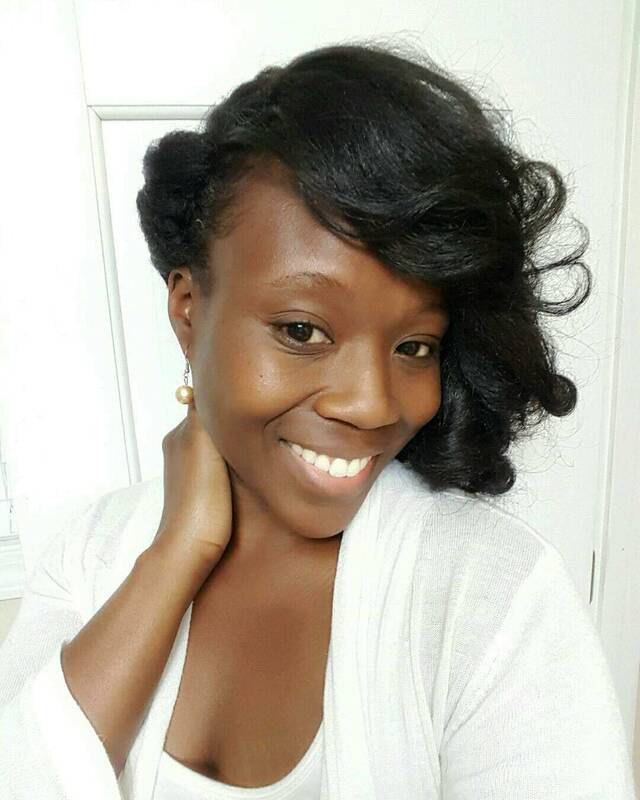 This simple design entails using some short and thick spirals to create a natural looking curly bob that you should style with a side part. 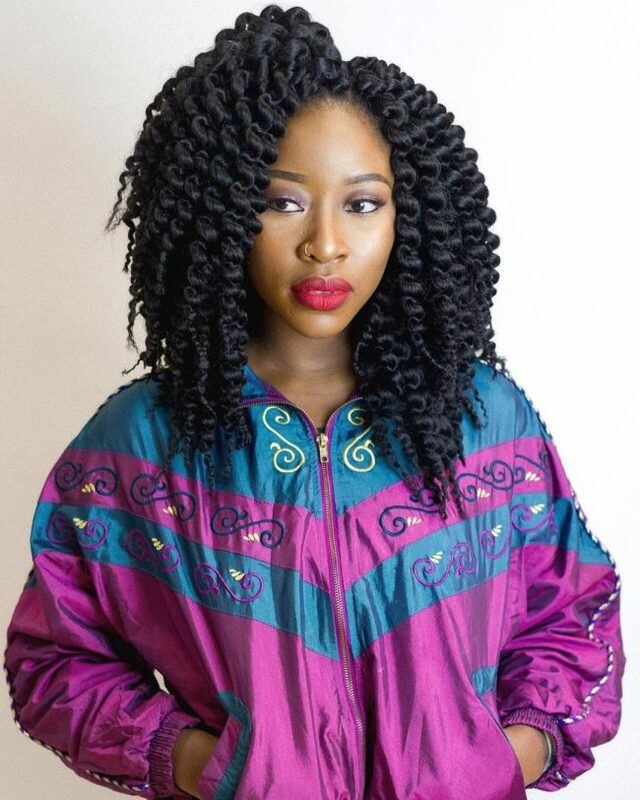 Styling your crocheted hair is vital as it is what determines how attractive it will look. 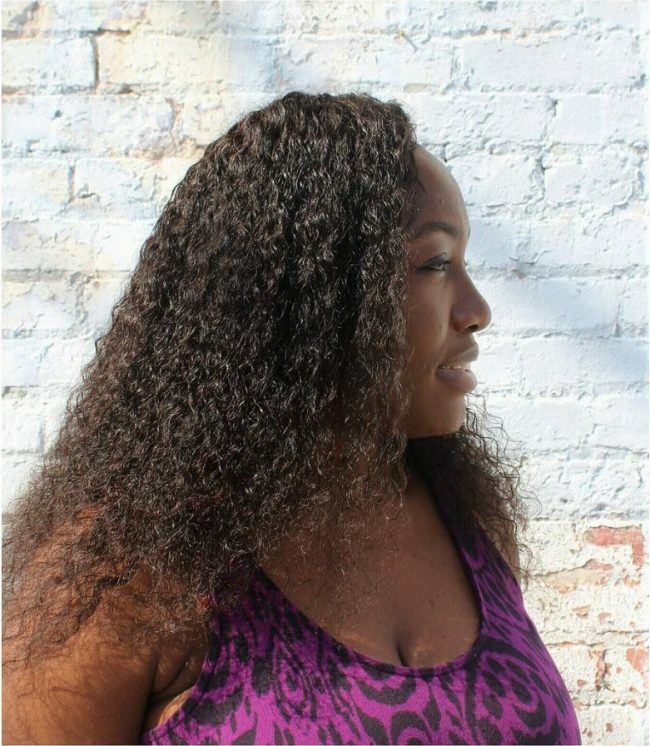 The black synthetic hair in this design might not look like anything special but dipping the strands in hot water creates some loose curls that are what makes this a top notch design. And to finish the headdress you only need to give the locks a simple side sweep. These face framing curly locks have everything that you can ever wish for in a hairdo. And although the design may look complicated it is as simple and straightforward as it can get. 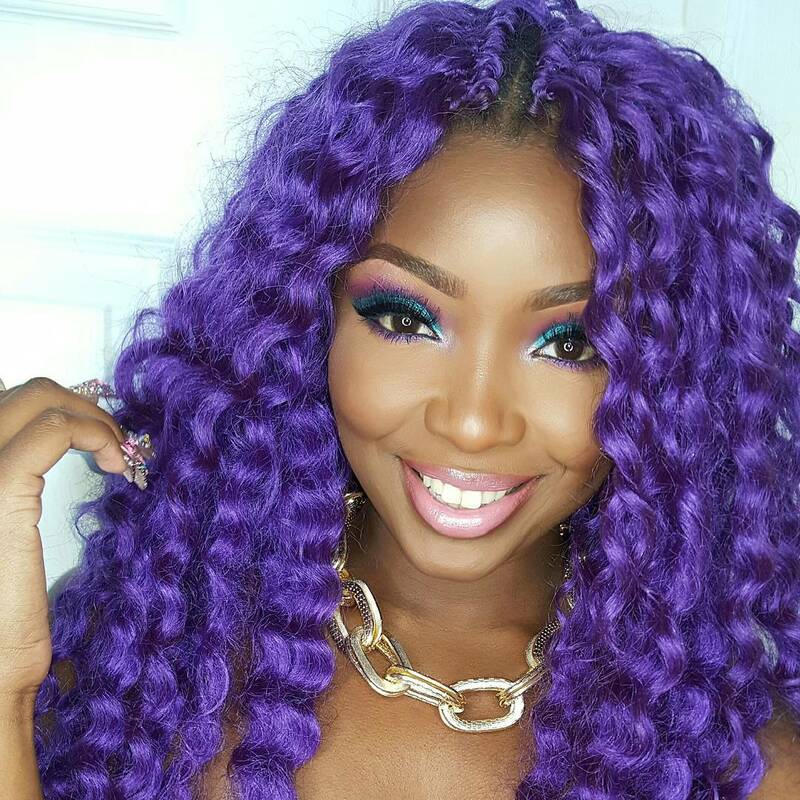 To create this look, you only need to crochet some curly purple extensions and style them with a center part. You should never shy away from any crochet design even if it looks complicated like this because it is still achievable. There is nothing hard in this style because you only need to choose the right extension and crochet it well to give it a firm appearance. The styling is also very easy because you only need a side part and to sweep the thick curly locks into a face frame. Some ladies prefer to go as short as possible while still maintaining some thick curls and so this is the right style for them. Apart from the natural looking short curls the hair also has a beautiful shade of brown that makes the curls pop and look extra cute. These locks are very easy to install, and you will not even need to use the services of a professional. 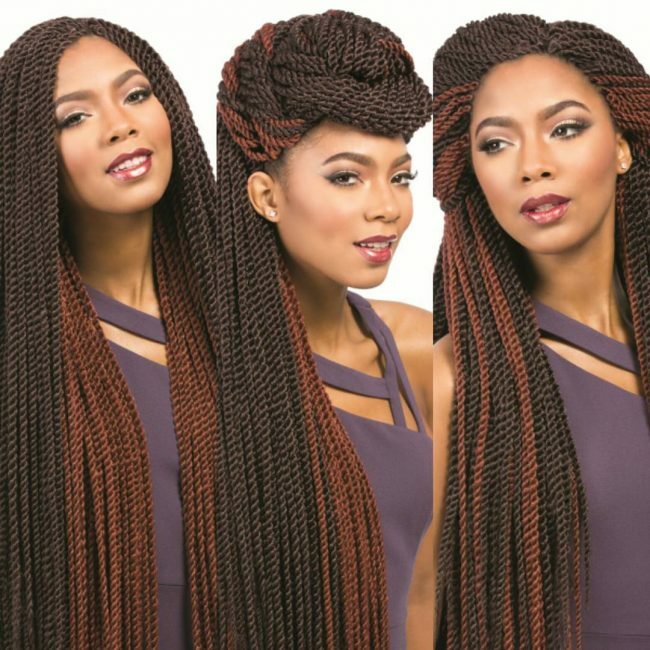 Their two-toned appearance that comes from the black and brown shades is just perfect, and they prove that a good choice of extension is all that you need to wear a classic crochet weave. 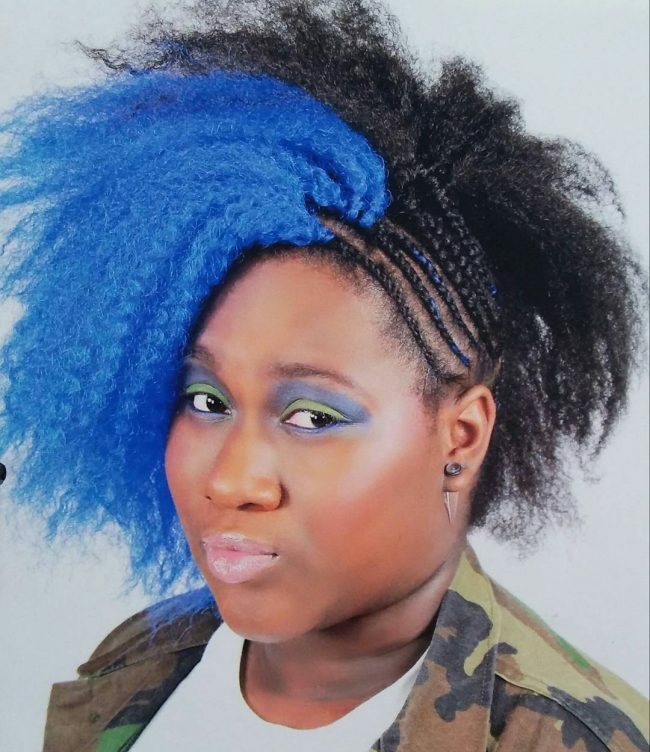 Here is another hairdo that shows the immense beauty that you can get a blue hairstyle. 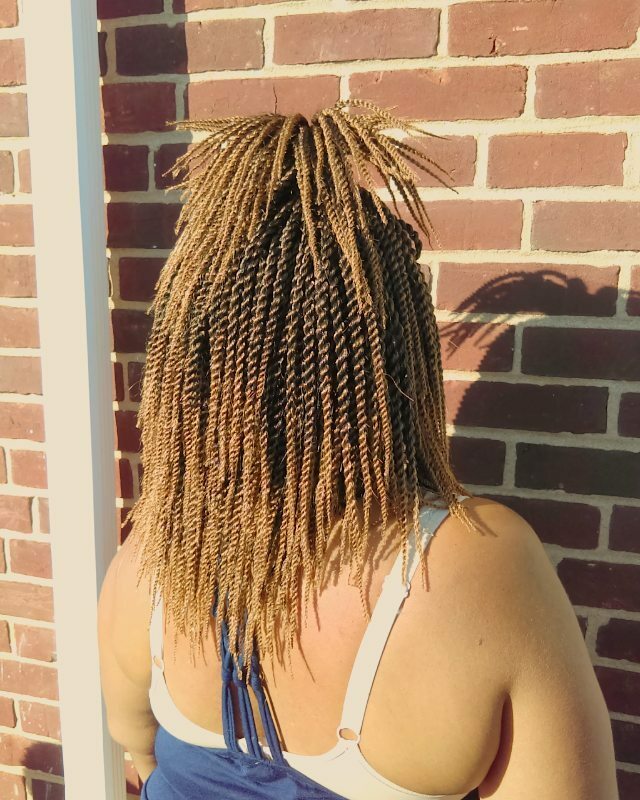 The Senegalese twists in this design look fantastic with an excellent color design that entails transitioning from dark to light blue on the ends. 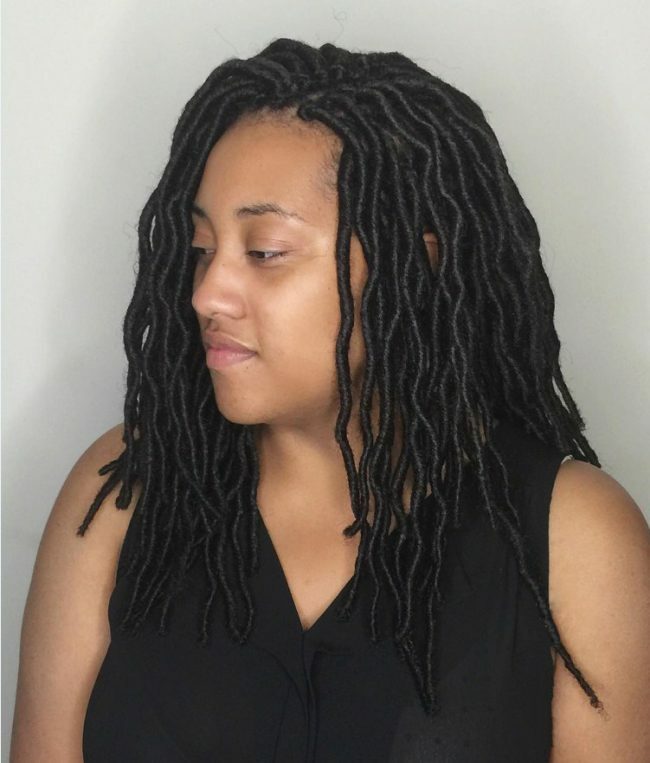 Since the twists are ready when you buy them, you can almost not go wrong with this style, but you also need to style it inventively with a beautiful design like this face frame. 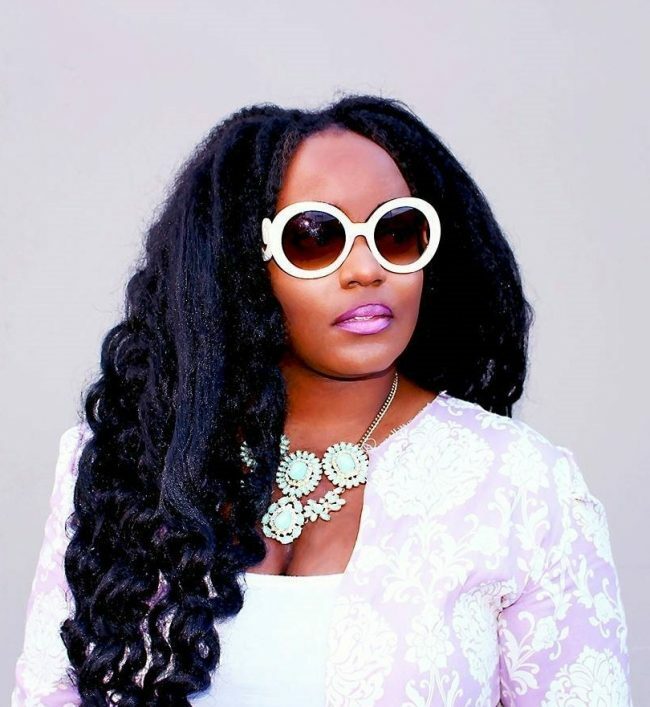 Faux Locs are the style to go to when you want something fun and protective for your hair. The ones in this design have a beautiful black shade, but their soft waves are what make them stand out. To style them you should form a side part and sweep the locks sideways. 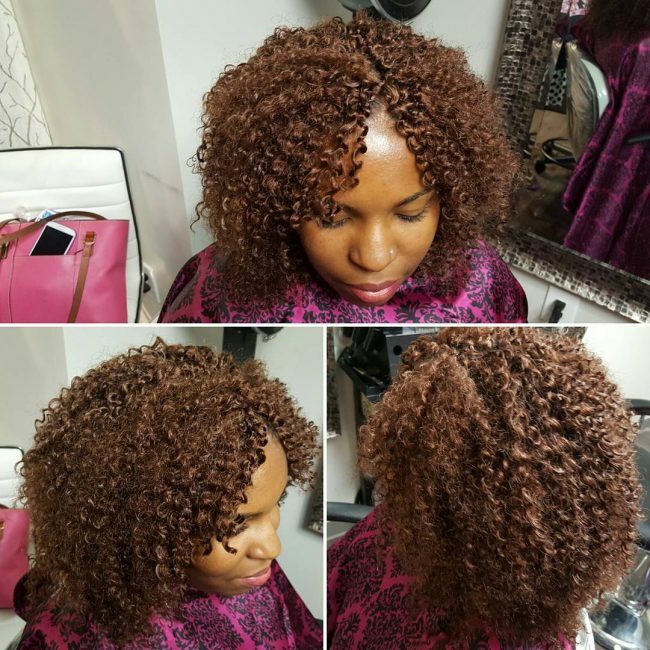 If you love perms and your natural hair does not make it possible to create them, a crochet weave will be the solution for you. The body wave in this design is a perfect example of this, and it has an incredible volume that makes it look very natural. 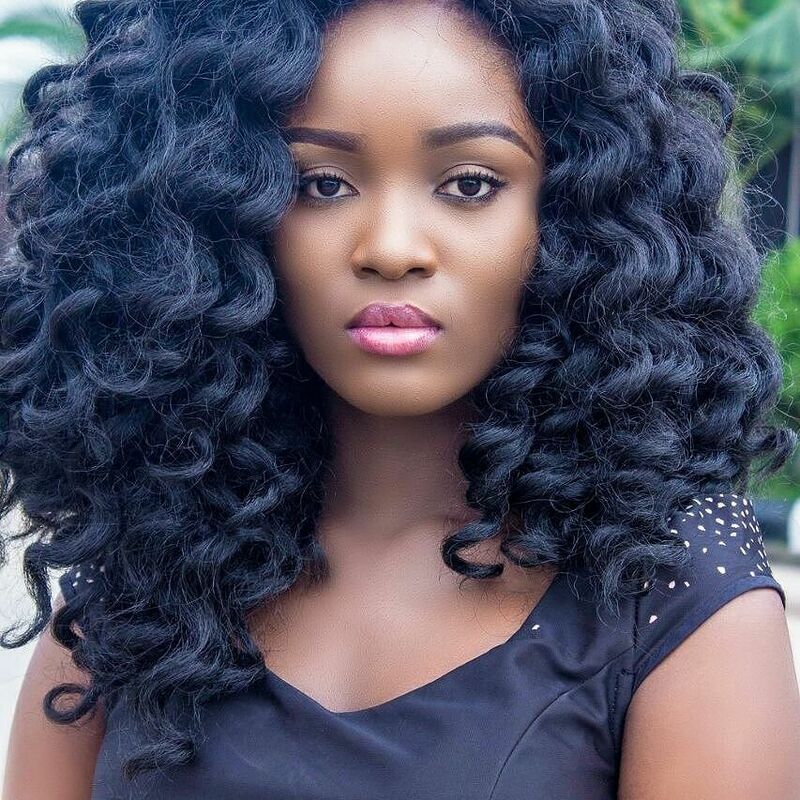 With this crocheted hair a simple face framing design and slight layering are all you need for styling. You can never grow tired of faux locs because there is always a new style to try out. 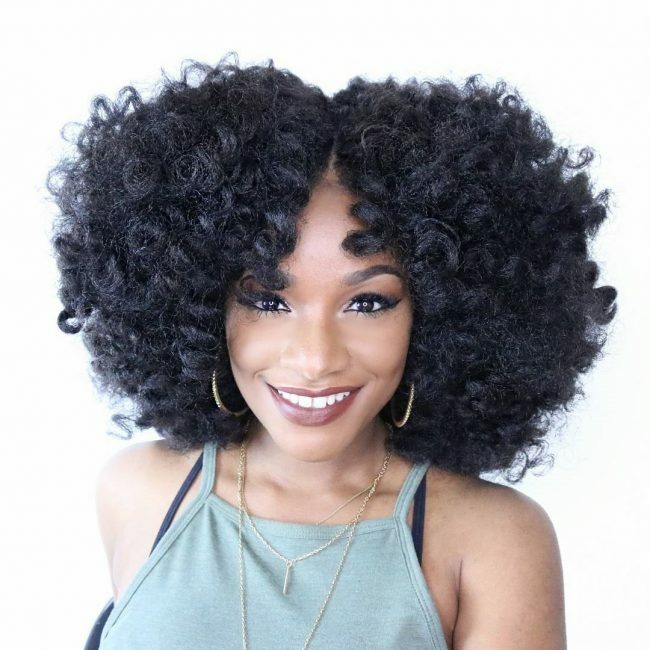 The ones in this hairstyle are a product of crocheting, and they have a lovely black tone that makes them look magnificent. However, their styling is also top notch, and it involves sweeping them back and tying them to form a half up style and finishing by accessorizing with some metallic beads. The volume and color of this headdress are what makes it look as stunning as it is, but the best thing is that you can replicate the design effortlessly. 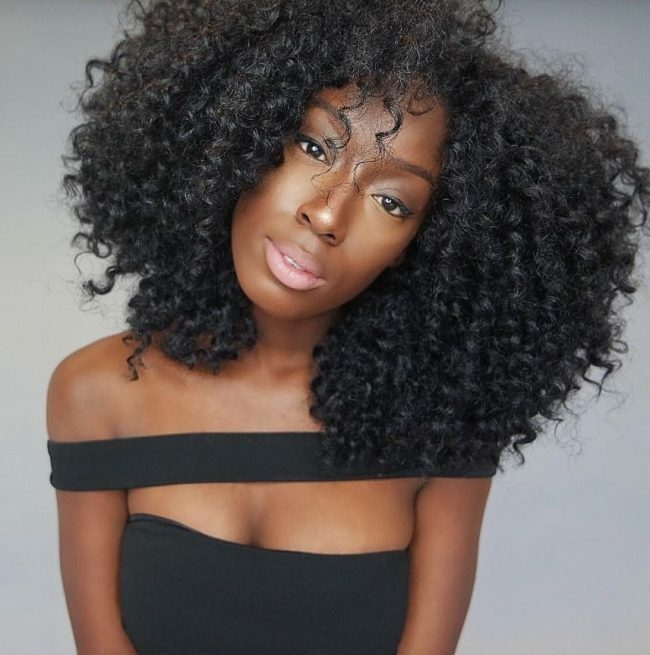 To wear this style, you will need to use some full dark brown human hair extensions with some brushed out curls and style it with a simple center part. 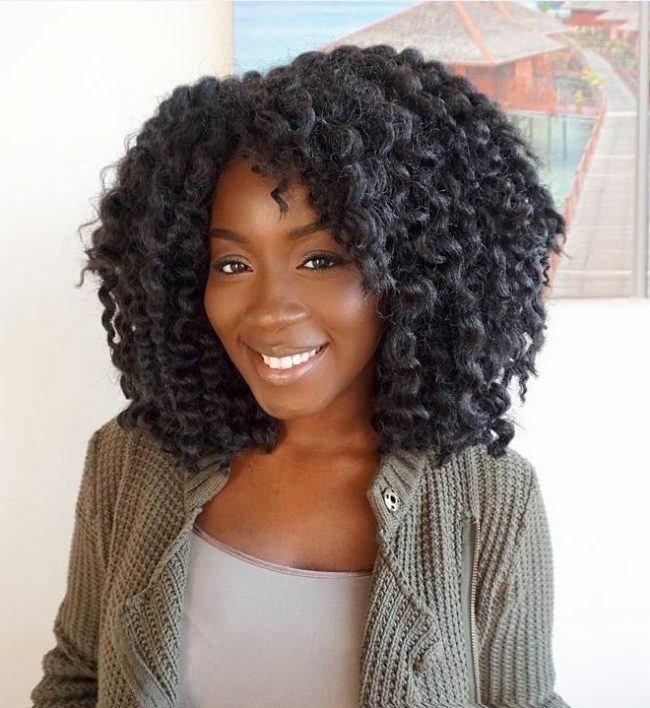 Jumbo crochet twists like these are very adorable, but they all look the same. However, you can still make yours look distinct with a simple half up styling and by accessorizing them with a beautiful flower headband. A style like this one will give a woman all the confidence she needs for any occasion. 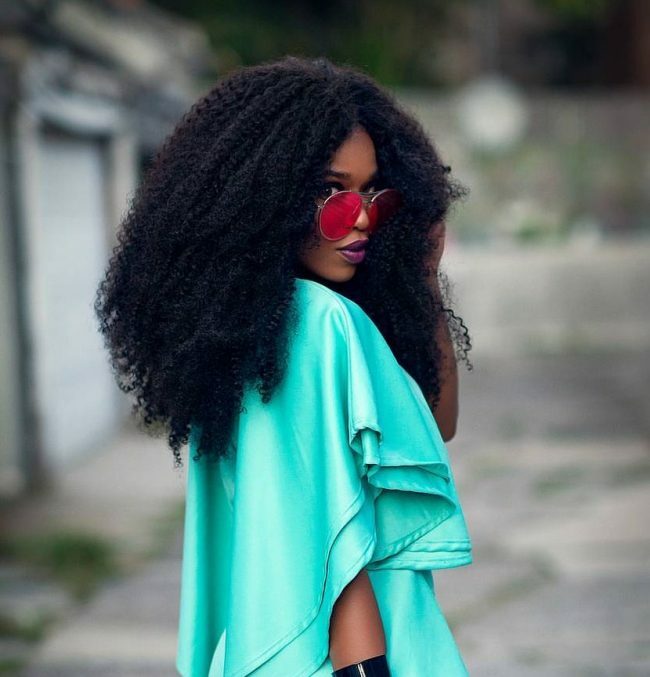 The thick curly mane looks fantastic, and it also has a unique natural look. 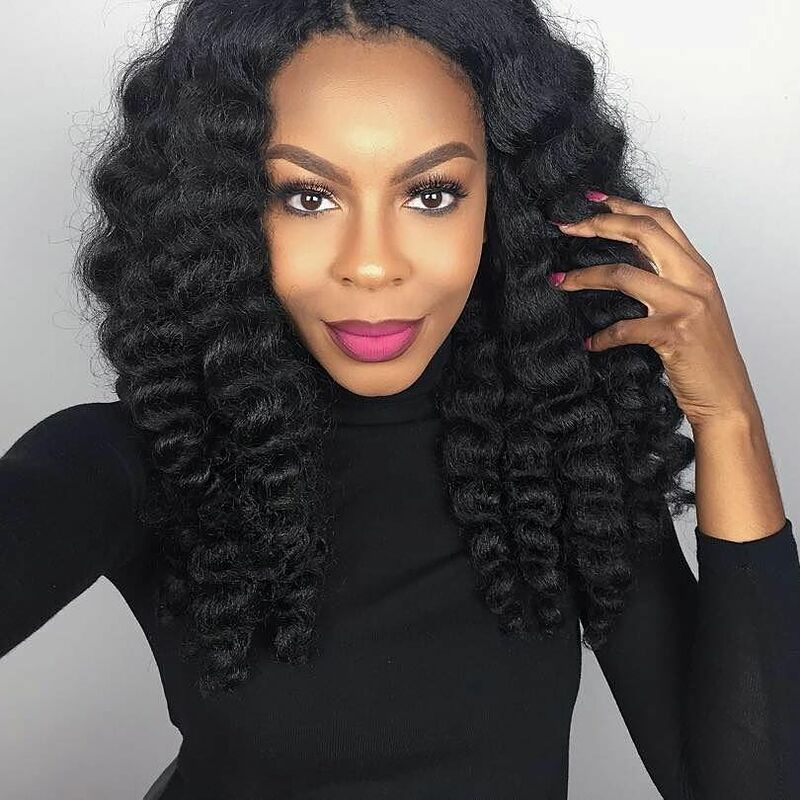 You will not need to do any complicated styling with such a perfect crocheted hair because a center part is just enough. It is hard to think of any curly hairdo that looks better than this, and this is more so given the fact that the locks are short. 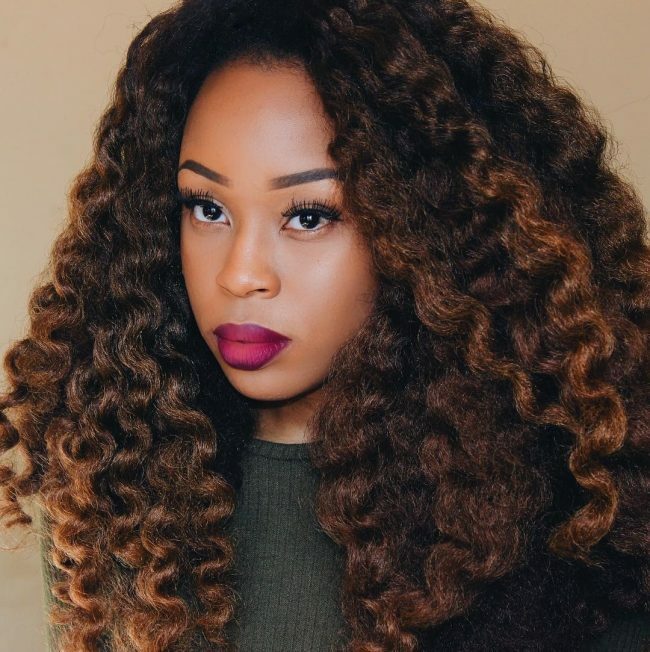 The thickness of the curls and their structure are just incredible, and a simple center part is all that you need to give them an exquisite and awe-inspiring design. The color transition from the black base to the whitish and pinkish blonde shade is just breathtaking, and it creates a unique ombre pattern. However, the crochet braids also have some beautiful spirals and a creative face frame styling that makes them look majestic. 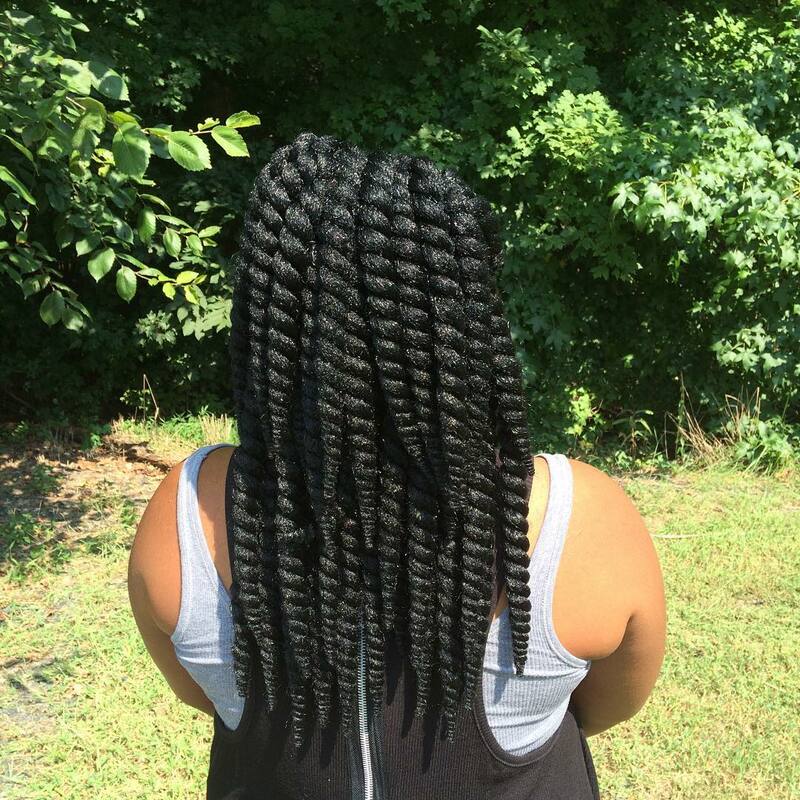 Marley twists are just fantastic, and you can never have enough of them. The ones in this headdress are massive, and they look very heavy, but they are not. They have an incredible dark tone and an innovative styling that involves sweeping them to the front over the shoulders. 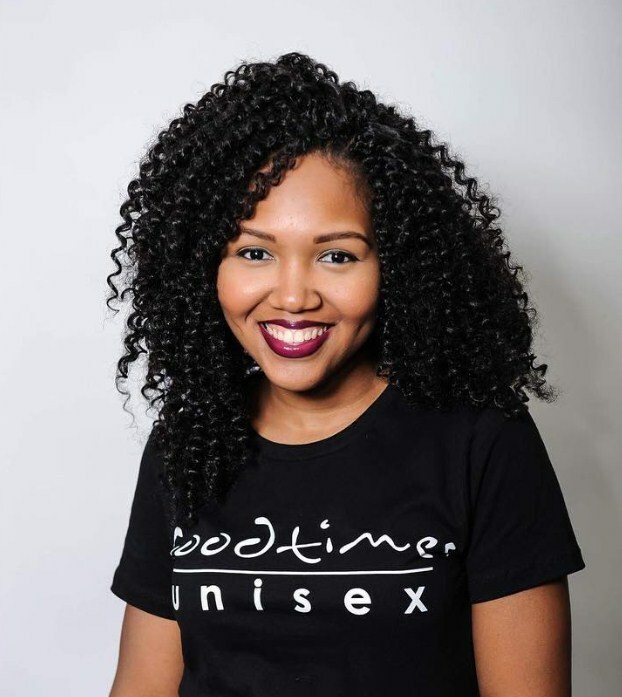 Every woman dreams of having a curly hair at some point, but you should not subject your hair to harsh chemicals or heat to get it because a crochet weave can also give you this look. The spirals in this design are short and thick with a center partitioning, but the slightly messy appearance that comes from running your fingers through is what makes them a distinct headdress. Most ladies prefer to go for curly extensions when they want crocheted hairdos, and this is not only because they are widely available but also because they look amazing. The ones in this style are very simple, and they have a natural tone. To style the curly locks you should sweep them to the sides to form a face framing design. 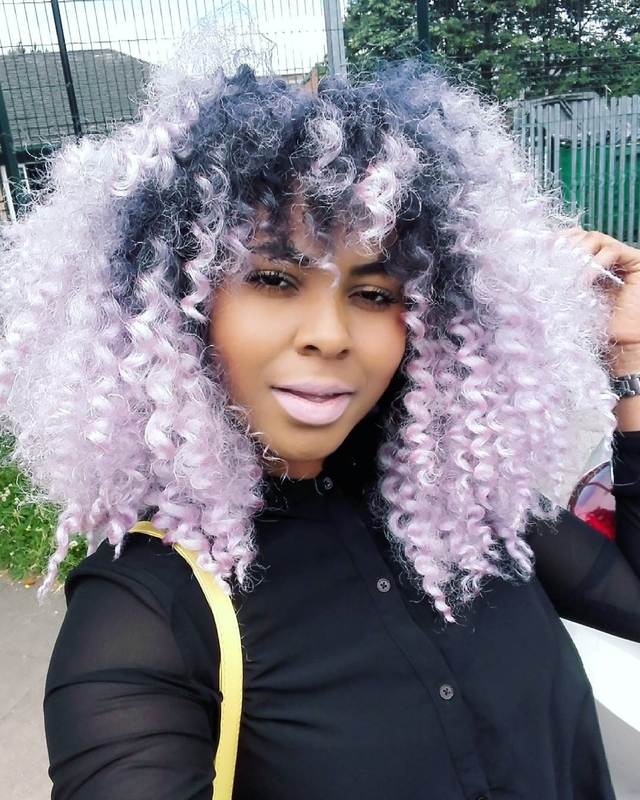 The unique silver gray shade of this crochet weave is one of the things that make it stand out. This style also has some small spirals that make it look very stylish, and you should style it by giving the locks a slight lift and sweeping them sideways. Sometimes a unique color is all you need to transform your hairstyle into something majestic. 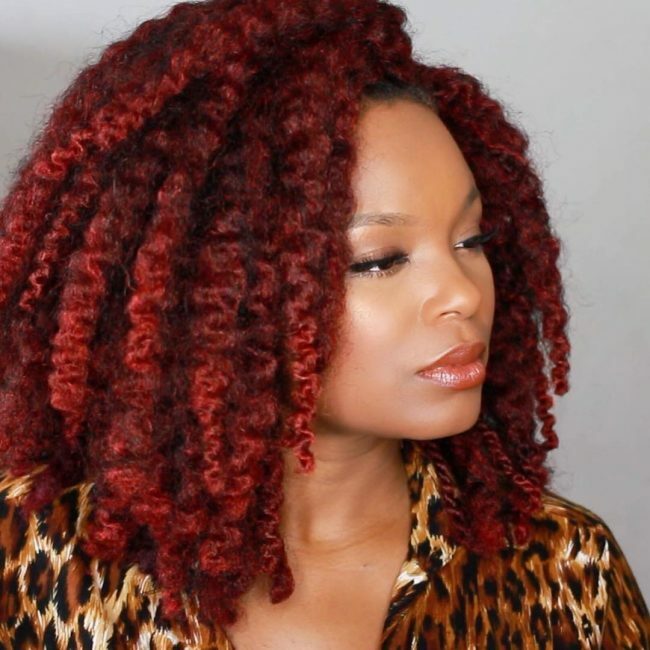 The vivid red hue in this design proves this as it makes the thick Marley twists look fabulous, and you only need to give them a side part and sweep them sideways to create a chic look. 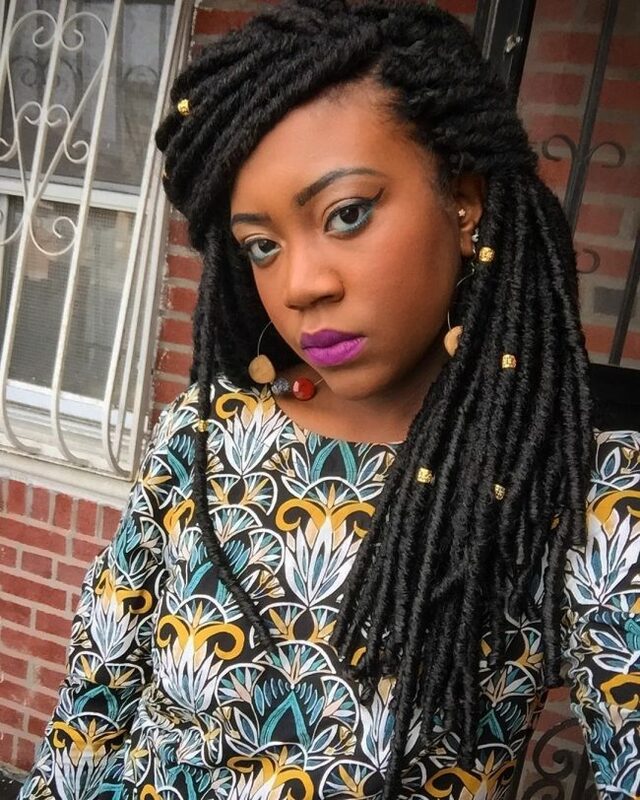 These crochets are also Marley twists, but their color, size, and styling make them look distinct. They have a unique wavy pattern that you should not worry about it because it comes with the hair and so you will not have to form it. You only need to crochet them well and give them a simple center part for styling. The look on these twists is what you would get if you untwist your jumbo twists. However, this weave comes with this look and so your only role in creating the style is crocheting it. The red shade is fabulous, and the styling is also inventive. It entails pulling up and tying some of the twists into a pony-like design at the top and leaving the rest to flow to the back freely. The thickness of these long purple crochets will make most ladies think that they are heavy, but this is not the case. In fact, they are as light as any other hairdo. They have some textured curls that make their hairstyle look stylish, and the side sweep is also an excellent styling. 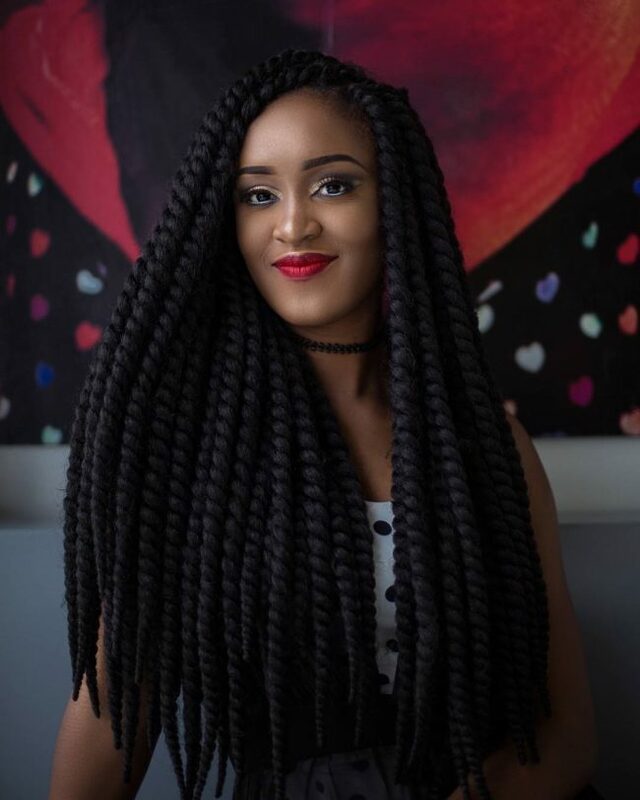 Crochet braids are just amazing, and the fact that they come in many styles also makes them an excellent choice for your protective headdress. 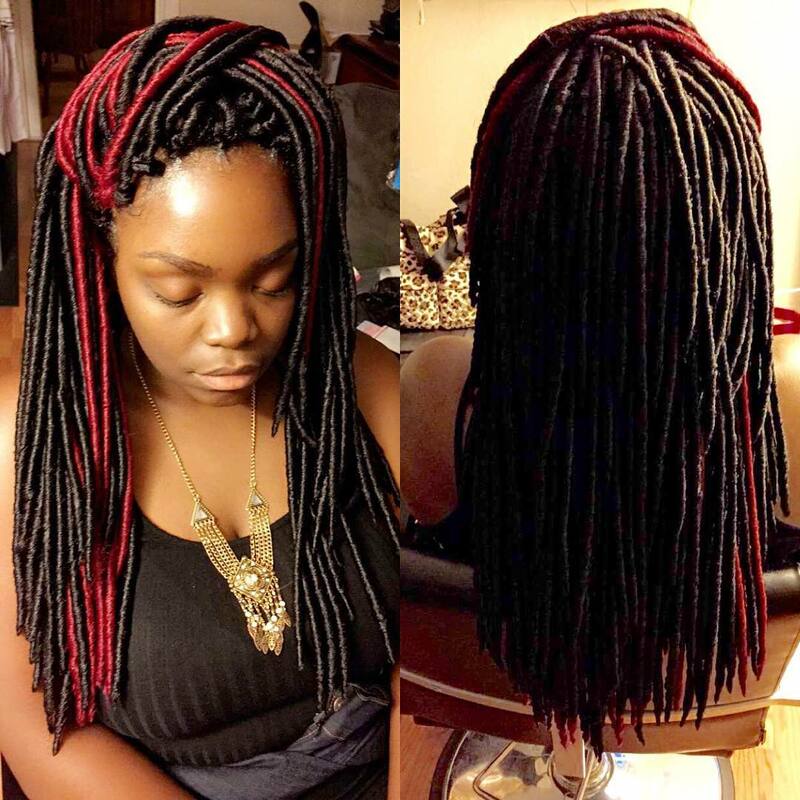 This design has some loose Marley twists that are quite thick, and you should style by tying them into a half up design. 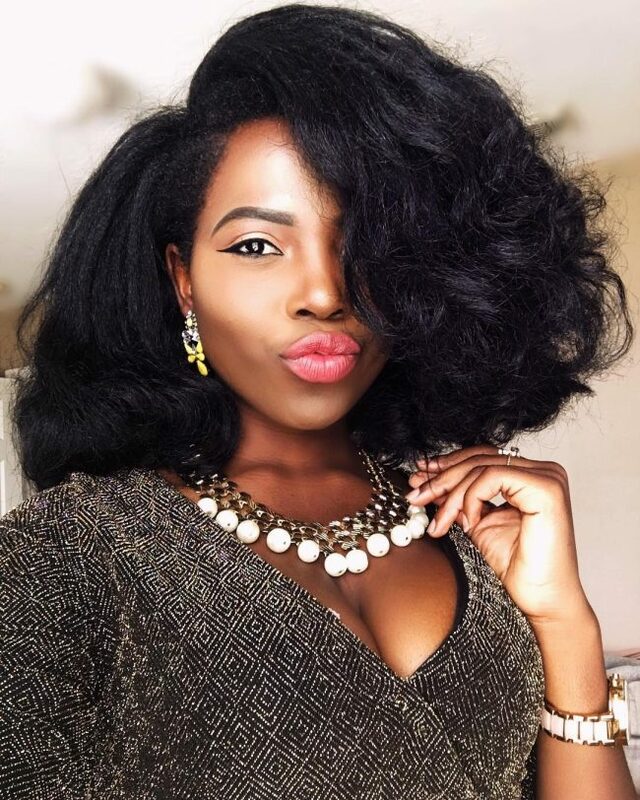 This hair looks very natural and with such a perfect weave few people can tell that it is not your natural hair. It has an excellent volume and some nice brushed out curls that make it look gorgeous. The mane is quite short, and so you will not need any sophisticated styling. 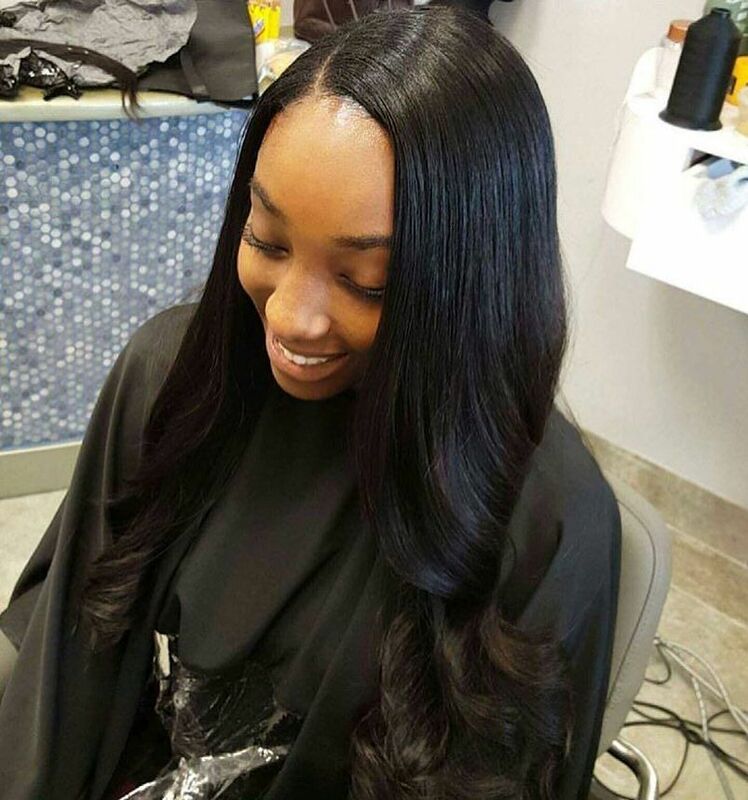 Weaves and extensions may be artificial, but their beauty is as natural as it can get. The ones on this design have a lovely dazzle and a unique appearance that comes from their soft curls and the skillful center part styling. 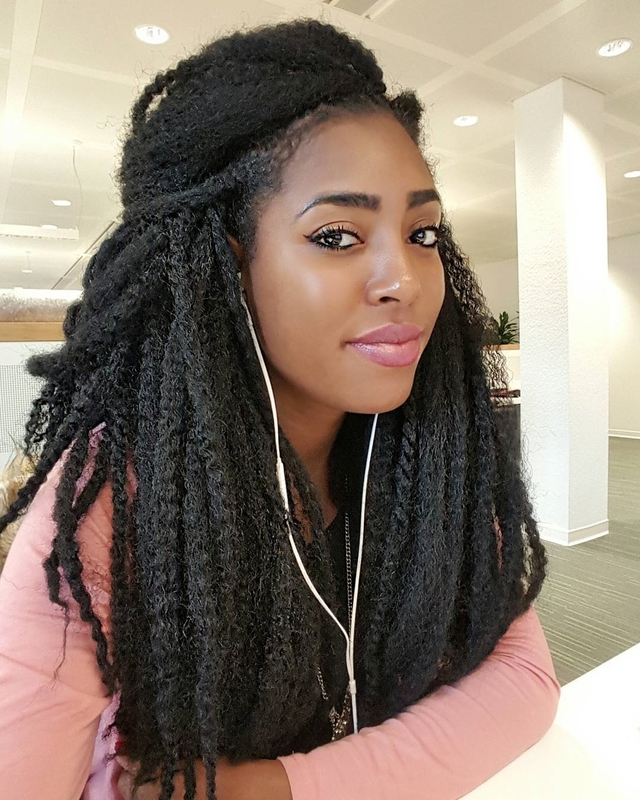 The bubbly look on these twists is stunning, and it is an excellent idea when you want to break away from the traditional look of big crochet twists. These locks also have a beautiful black shade, and you should style by sweeping them sideways from a center part. A mane like this one will always make you the center of attraction, and it is also not difficult to form. 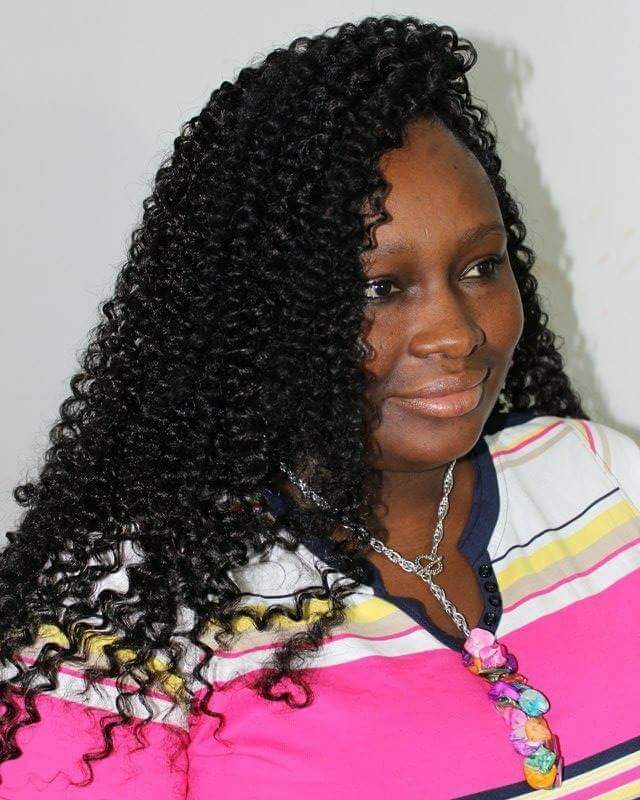 Just like with other crocheted designs you only need to choose your extensions well and also knit them in a pattern that spreads them into a thick afro design. The brown shade with dark roots is also perfect for the style. 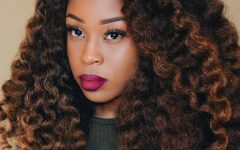 A crochet weave will allow you to wear any hairdo that you like, and this is regardless of the length and type of hair. 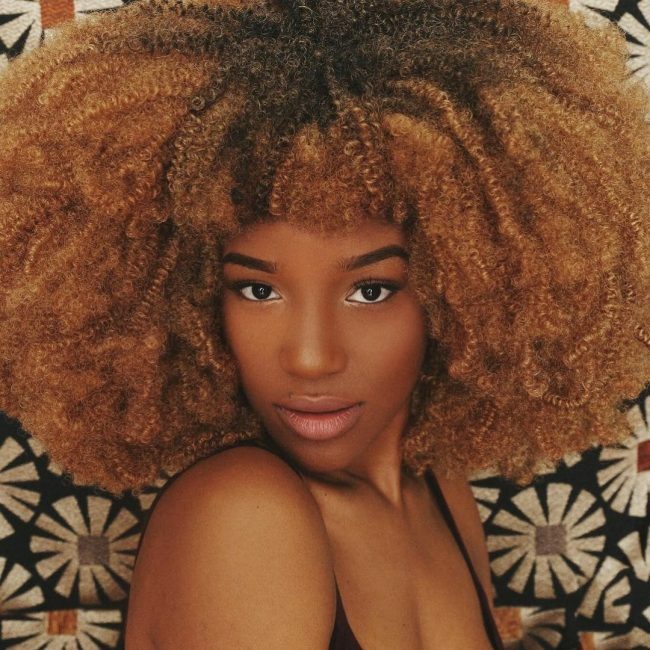 Whether you like full curly styles or straight ones, there are still many options. Look through the picture gallery above for some ideas to get you started.